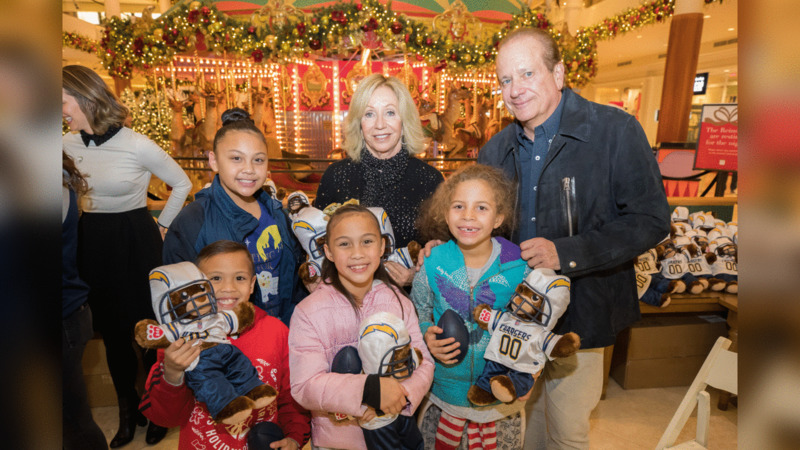 It’s the season of giving, and on Friday night, Los Angeles Chargers Controlling Owner and Chairman of the Board, Dean Spanos, and his wife, Susie, participated in the 12th annual Sharing the Spirit Holiday Party at South Coast Plaza. The shopping center was transformed into a winter wonderland for 500 deserving children as they were treated to a night of holiday fun created by Costa Mesa’s Festival of Children Foundation, The Happiness Foundation and hundreds of volunteers and generous sponsors and donors. The Spanoses and members of the Chargers’ staff passed out footballs and Chargers teddy bears to the kids. As Susie attested, the reactions she received made a lasting impact on her. Dean and Susie are the inaugural recipients of the Carousel Spirit Award as they display an enduring commitment to improving the lives of children in Southern California. But as good as it was for Dean and Susie to give back, they want others to share in their philanthropic endeavors. Giving back is a cornerstone of the Chargers organization and bringing awareness to helping others is of the utmost importance, especially this time of year.